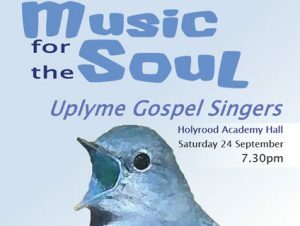 Uplyme Gospel Singers, who delighted audiences in the region with vibrant performances last year, are presenting “Music For The Soul”, a concert of traditional and contemporary “Gospel music and more” at 7.30pm in Holyrood Academy main hall on 24th September. With vocal music spanning African, American and British sources, a number of powerful soloists and even a Barbershop Quartet, there will be plenty to appeal to lovers of gospel, blues, folk and similar genres. Proceeds from the evening will be divided between the Singers and Chard’s Forefront Community Centre and the projects it hosts, including the WorkLife job club, Lords Larder food bank, dependency clinics and coffee morning drop-ins. Leader and conductor Chloe Stratta, a soprano soloist of growing renown in opera and oratorio, said the Singers aim to blend the enthusiastic joy of an amateur society with a deep commitment to the highest standards of musical presentation. “We are a small choir performing uplifting music straight from the heart, and it will be a joy for us to share it in Chard,” she said. Tickets are available now from the Forefront Centre in Fore Street, Chard at £5 each; or call 01460 66080.